If any of you southern boys happen to find yourself in the northern Utah area during the months of October, November, December and half way through January and want an experience you wont soon forget, I would be honored to take you out for some hunting or just an airboat ride. I hunt ducks, geese and swans with an airboat, mud boat and layout boat (depending on what species I'm targeting). We normally get a wide variety of waterfowl such as Mallards, gadwalls, pintails, wigeons, cinnamon teal, green wing teal, northern shovellers (spoonys), canvasbacks, buffleheads, redheads, ringnecks, ruddy ducks, lesser scaup, lesser goldeneyes.. I'm sure I'm forgetting some but you get the jist. The limit is 7 ducks per day and 4 geese per day. If you want to apply for tundra swans it is a lottery draw system and it is currently open until 7/19/2018. I can provide a nice shotgun, all ammo, a decent amount of camo. What I cant provide is housing, food and licenses. 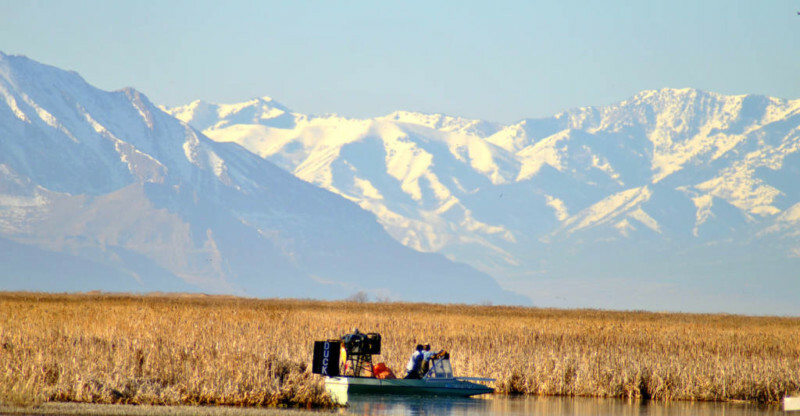 If you come after about Christmas, we drop the airboat right on the ice and drive out to the open water of the great salt lake and do a "coffin hunt" out of shallow water coffins surrounded by silhouettes of ducks and its generally a pretty quick shoot, but has potential to be very cold. Anywho. I would love to have any of my airboating brothers and sisters if you find your way out in the beautiful state of Utah. Wow. Very nice offer and you paint a nice picture. It sure does sound cold. Are the coffins a metal box set down at the waters edge? I hunted Arkansas a few years back and we were all in a steel box with a bench seat together. It had a natural camo lid that flipped back. Once the lid flipped back it was like a little battle ship with all them 10 and 12s sticking out! Too bad I'm far off. Sounds awesome. When flying into salt lake city I always look out the window and dream of hunting that lake, gorgeous scenery. I'm sure it a hunt of a lifetime,on my bucket list for sure. Man, sometimes I wish I did like duck hunting. The places you get to go to duck hunt are always the best, even if it isn't the best time! Unfortunately it's just not my thing, I just don't like to eat them things. Plus, with my short attention span and poor eyesight, I usually end up having to go back to court for the wrong damn duck. But killing Swan's! Hell yah, now you got my attention, I hate them damn Swans, they crap all over the reflecting pool in front of the Lincoln Memorial, they look all smug but they are a disgrace I tell yah. I'll kill them things all day if I have to, but you gotta keep em. How much does it cost for an out of state tag? I'll trade you a Swan hunt for a gator and/or hog hunt. I'd take you deer hunting, but those are not guarantee hunts in these parts. nice to see another duck hunter from the this side of the continent post up some pics of your rigs! Mikeryjojo wrote: Too bad I'm far off. I lived in tampa for a couple years back in 03-05. What an amazing place! I wish I could move back.. maybe some day. Mossy Cypress wrote: Sounds awesome. When flying into salt lake city I always look out the window and dream of hunting that lake, gorgeous scenery. I'm sure it a hunt of a lifetime,on my bucket list for sure. Yeah, those are exactly the marshes we hunt. It is beautiful here. you are welcome in my boat any time you can make it to Utah! Slidin Gator wrote: Man, sometimes I wish I did like duck hunting. The places you get to go to duck hunt are always the best, even if it isn't the best time! Unfortunately it's just not my thing, I just don't like to eat them things. Plus, with my short attention span and poor eyesight, I usually end up having to go back to court for the wrong damn duck. You have to have a small game permit to apply which is 32 dollars for a 3 day out of state or 65 for an annual license then the swan application is a separate lottery drawing. it costs 10 dollars to apply and an additional 15 if you successfully draw a tag. but I'll tell ya, its an experience youll never forget! The coffins are basically large plastic boxes. they aren't permanent and they are only large enough for 1 person to lay down in. some places have those sink boxes you are talking about, that can be made out of metal or cement but they are illegal on public property. I'll see if I can find a picture..
Gee, the pics you posted are awesome, any big white things in the sky around here are either rocket launches or a cloud that's gonna turn black soon. I've been there before, but I only know it from the old Kodak photos. I appreciate your kindness and may take you up on that offer sometime in the future.It's a bucket list trip for sure,area ok for kids? I have a 11 year old son that I really would like to make the trip for. Slidin Gator wrote: Gee, the pics you posted are awesome, any big white things in the sky around here are either rocket launches or a cloud that's gonna turn black soon. I've been there before, but I only know it from the old Kodak photos. Yeah, a lot of us do run open cages. We don't have any trees or anything really dangerous running through our props, as we generally sit 10 feet or more in front of our engines. Ive never had an issue with a half cage but if my boat were florida style I absolutely would run a full cage. Mossy Cypress wrote: I appreciate your kindness and may take you up on that offer sometime in the future.It's a bucket list trip for sure,area ok for kids? I have a 11 year old son that I really would like to make the trip for. Absolutely! Even if someone doesnt have waders we can hunt right out of the mud boat and I can pick up all the birds and decoys. Easy Peesy. "Welcome to the Dark Side..."
Matt I was near you this week. Drove from Yellowstone down to (Logan, Salt Lake City, Provo) Moab to visit Arches Nat Park. We don't have any trees or really any hazards of hitting the prop on things here. and most guys like to park the airboat in a garage. I mean, I don't really want my 13,000 waterthunder LS engine sitting out in the elements year round.. Only thing I have ever had go through the prop is a coot. (didn't end well for the coot or my oil cooler on my last boat). Some guys do run them and you obviously cant be to safe with an airboat. If I were to do it again I would build a segmented / removable pancake cage for my prop. But since we sit 10+ feet ahead of the motor it is really fairly safe for us to run minimal cages. kwanjangnihm wrote: Matt I was near you this week. Drove from Yellowstone down to (Logan, Salt Lake City, Provo) Moab to visit Arches Nat Park. Dang! I wish I would have posted this last week. I would have taken you out for a ride on my airboat. or taken you up in the mountains on some 4 wheelers or something. Sorry. hopefully raincheck!